Surf Safari mixes two rather unusual topics, bringing the animals of the jungle to the beach and making them surfers. 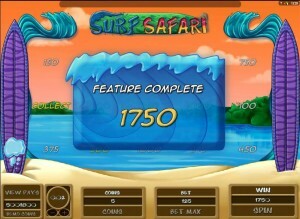 The surfer and the safari themes have been used plenty of times before, but I haven’t seen them mixed like this. 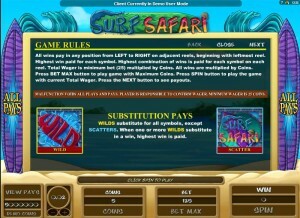 Microgaming did a decent job with Surf Safari, the combination of themes being a successful one in this case. 25 bet lines may be selected each round, the game having 5 reels for them. 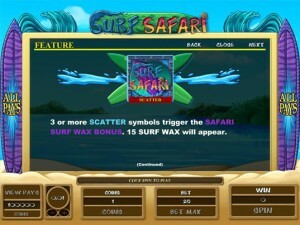 The list of features starts with the ways to win, after which it continues with wilds, scatter symbols and a bonus game. It has a prize that goes up to $12,500. 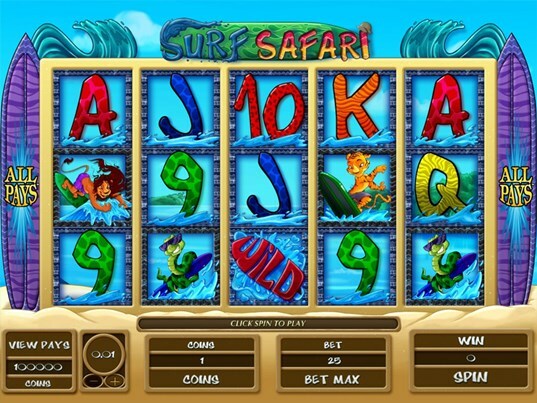 The features of Surf Safari are all things that you expect to see these days in modern slots and you kind of feel cheated when they’re missing. The ways to win are a bit more rare, but the wilds, scatters and the bonus game are all normal. 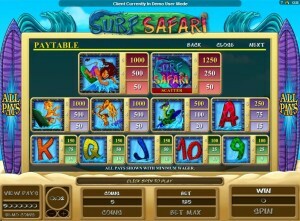 First, the game has 243 ways to win, which means that it doesn’t form combination like most slots do. 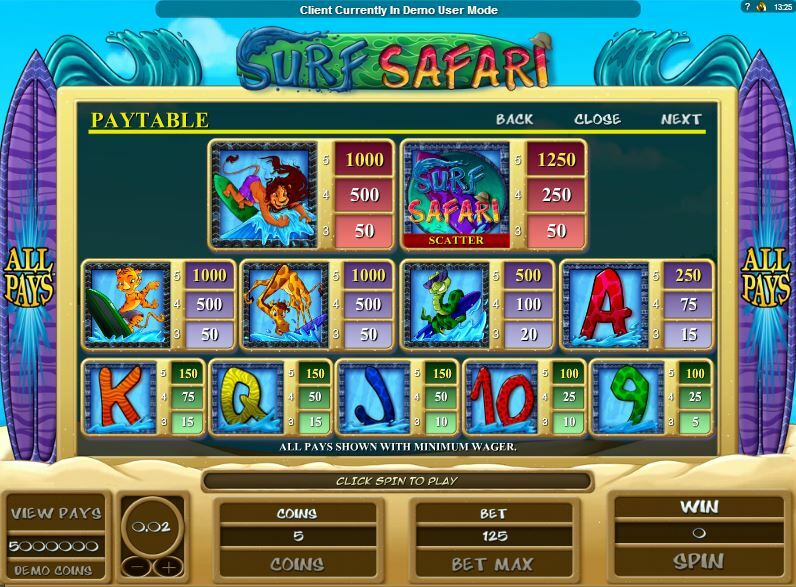 While a regular slot will want the symbols to appear on predetermined positions on certain paylines, Surf Safari only wants them to be on the right reels. In order for a combo to form, the symbols need to be on adjacent reels, going from left to right. Wilds are part of this game and they are especially important since they no longer have to be on a certain line, instead being enough that they appear on the right reel. A single wild can help out with the formation of more combinations than before, also thanks to the ways to win. Wilds are not capable of substituting for a scatter symbol though. They also don’t form their own combinations in this game, so they have no prizes to give directly. What defines a scatter symbol is its ability to offer its prizes by being in random locations, not on predefined ones. Prizes of up to 1,250x are awarded when as many as five scattered Logos are present on the screen, plus you get access to the bonus game. 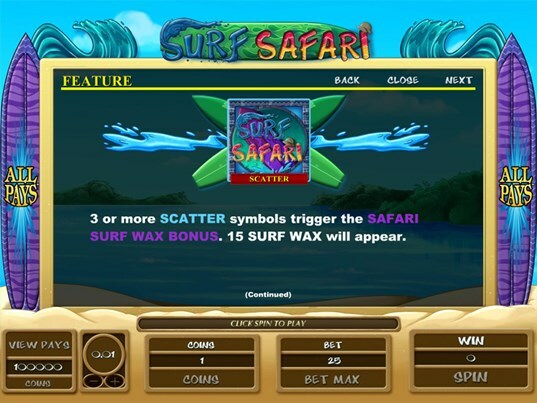 With the assistance of the scatter symbol, you can get inside the Surf Wax bonus game. 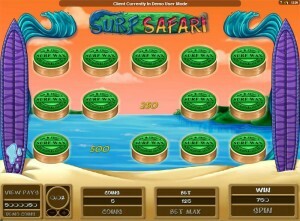 3 or more Logos scattered on the reels are needed before this bonus game can start. You get a new screen next, where 15 surf wax options are in front of you. You keep picking and getting prizes from each one, up until the point where you hit the Collect message. That’s when the bonus game ends, and you walk away with all the prizes you found. 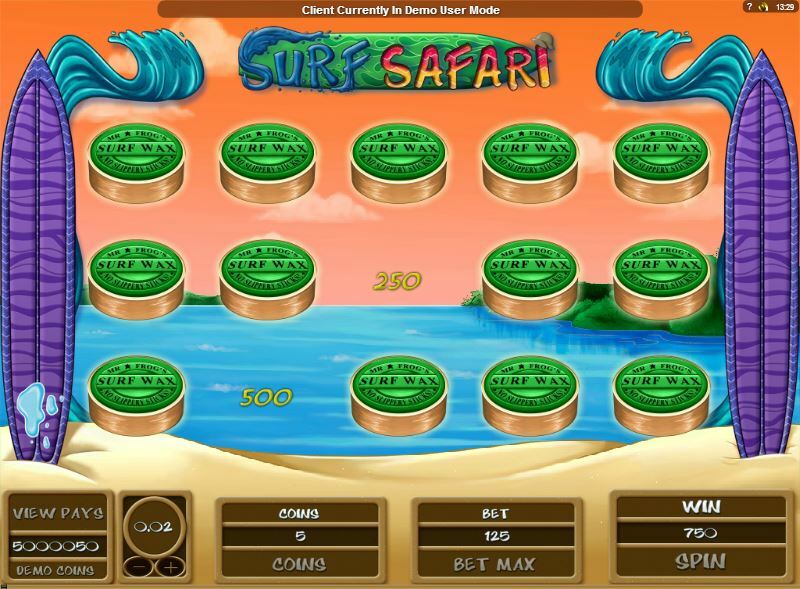 A maximum of 250 coins may be selected in a single wager, using up to 10 coins for each of the 25 bet lines. You may modify the coin value as you see fit, as long as you are within the range of $0.01 to $1. The game’s largest wager will go up to $250. 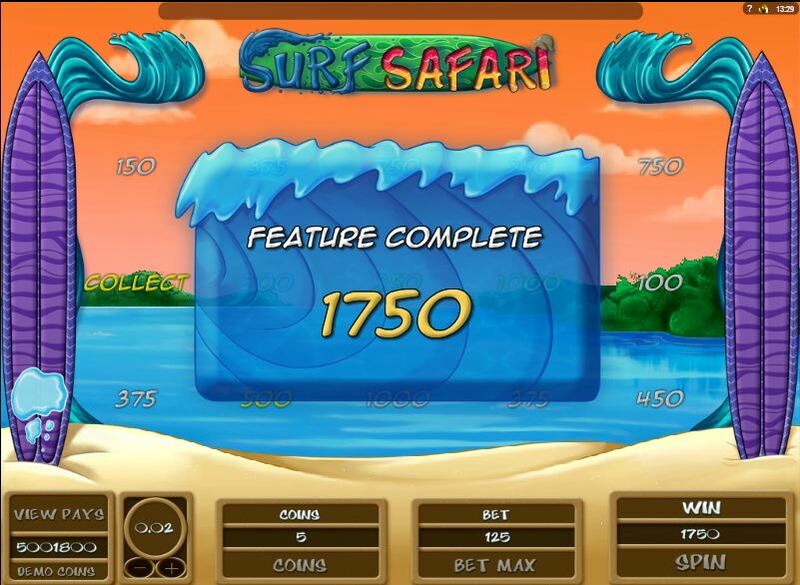 With the scatter symbol’s help, you can get up to 1250x the line bet, so up to 12,500 coins or $12,500. Everything has to do with surfing in this game, the safari part being more like an accessory. The reels are placed on the beach, with two surfboards on its sides and with the ocean further away. The symbols are all surfing, starting with the jungle animals and continuing with the playing cards. Speaking of the playing cards, their way of making them themed involves giving them furs of different animals (zebra, leopard, giraffe style, and so on) but making them of different colors. Symbols: Wild (wild), Lion (1,000x), Surf Safari Logo (1,250x, scatter), Tiger (1,000x), Giraffe (1,000x), Snake (500x), Ace (250x), King (150x), Queen (150x), Jack (150x), 10 (100x) and 9 (100x). The theme is unusual enough to make people curious, plus the designers spent plenty of time polishing up the symbols and making the game look good. The features aren’t that special though, plus I’m not impressed by the top prize either. 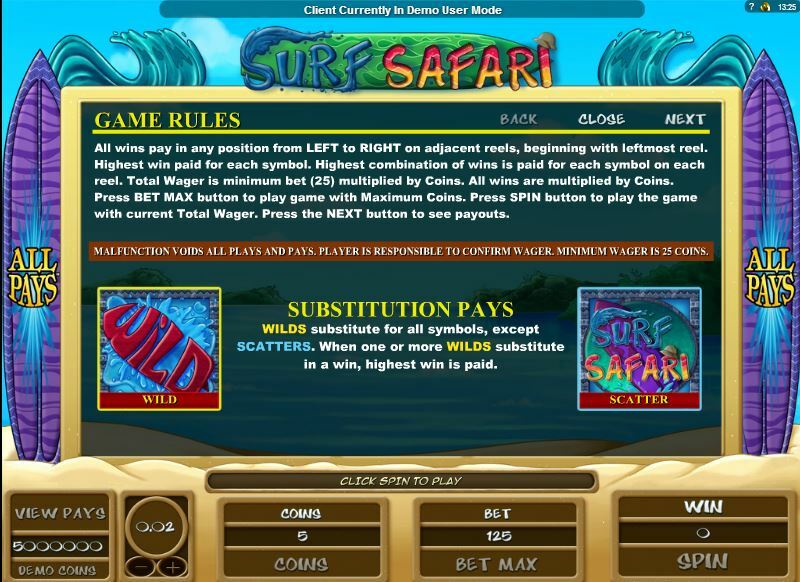 You will find Surf Safari at any online casino which chooses to use software from Microgaming, playable either for free or for real money.